Deepen your sense of the past at sights like Tampere Cathedral and Birthplace of Jean Sibelius. 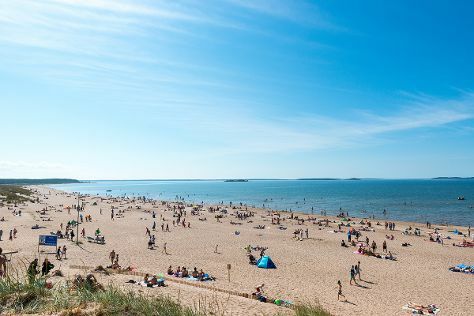 Change things up with these side-trips from Tampere: Yyteri Beach (in Pori), Haemeenlinna (Hame Castle & Evo Hiking Area) and Seitsemisen Kansallispuisto (in Ylojarvi). see Sarkanniemi Theme Park. The adventure continues: look for all kinds of wild species at Hatanpaa Arboretum, examine the collection at Vapriikin Museokeskus, tour the pleasant surroundings at Pyynikki Park and Observation Tower, and test your problem-solving skills at popular escape rooms. To find ratings, reviews, traveler tips, and tourist information, read our Tampere online attractions planner . If you are flying in from Algeria, the closest major airport is Tampere-Pirkkala Airport. In June, plan for daily highs up to 20°C, and evening lows to 9°C. Finish your sightseeing early on the 27th (Thu) to allow enough time to travel back home.